Founded in Melbourne Florida in 1981, Medicomp specializes in providing proprietary cardiac telemedicine services, including Mobile Cardiac Telemetry, Clinical Trial Monitoring, True AF Burden Monitoring, 30-day Event Monitoring, and Holter Monitoring. 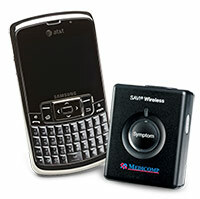 in 2009, Medicomp Inc., that it received FDA clearance for its new SAVI Wireless Mobile Cardiac Telemetry (MCT) system. The SAVI Wireless system gathers real time ECG data and transmits the information via wireless cell phone to Medicomp’s 24/7/365 Cardiac Monitoring Center. The SAVI technology sends clinically-relevant symptomatic and asymptomatic arrhythmia data over the cellular network. The SAVI Wireless uses Medicomp’s on board Diogenes ECG algorithm. According to Medicomp, the Diogenes is the only ECG algorithm FDA cleared for the analysis of P-Wave abnormalities. Small device with 2 components Pendant and the SmartPhone heart’s ECG in real-time. Stores 30 days of 2-channel ECG. The data is then sent to Medicomp’s Cardiac Monitoring Center over a cellular network. The only MCT technology to offer rate, rhythm, morphology, and P-wave analysis. The ability to analyze P-wave abnormalities useful for atrial fibrillation.